Each month Digital Signage Connection asks their members of the DSE Advisory Board a question of the month. 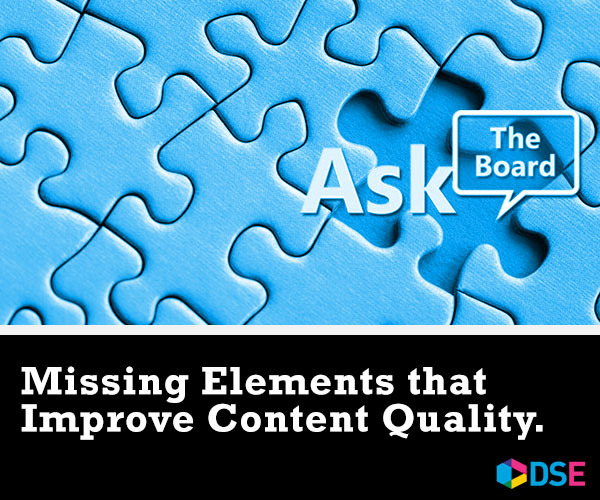 This month, the question focuses on the elements needed to make quality digital signage content. Here is a response from ClockNine’s Chief Creative Officer, Travis Kragh. What elements are missing from digital signage advertising that would improve the quality of content immensely? Carefully developed digital strategy and consideration of your environments are two things that can immediately improve the quality of your content. We often see digital signage campaigns that are quickly slapped together from an existing TV commercial or print ad. Don’t get me wrong, brand consistency is important for integrated campaigns but that doesn’t mean your TV commercial will be a good fit for your digital signage network. Challenge yourself to understand the people you are trying to connect with and the moment in time that you are speaking to them. Timing – Understand your opportunity to connect is limited. Make sure your message is easily digestible and highly visible for the full duration of your content. Motion – Use it with a purpose to draw attention to key elements in your design. Technology – Be innovative and incorporate technology whenever it makes sense. At ClockNine we create Smart Content (TM). Our data infused content helps us better connect with consumers more authentically. Using technology will help you keep your content fresh and deliver the right message at the right time. Be smart and remember to have fun.